Linda Shenton Matchett: Happy Valentine's Day! Growing up, Valentine’s Day was always extra special because it is also my mother’s birthday. Yep, she’s a Valentine’s baby, so for me the holiday is also about cake and presents. Who doesn’t love that? Nowadays, Valentine’s Day is big business. With over 1 billion cards sent annually, it is the second most popular card-sending day (Christmas is the most popular). Chocolate and flower sales also spike on this day. So when did Valentine’s Day begin? Apparently, no one is really sure. Some accounts claim the holiday has Christian roots, while others are adamant that pagan and Roman traditions are where it all started. The truth is probably somewhere in the middle. One story talks about a man named Valentine who defied Claudius II’s edict prohibiting his soldiers to be married. 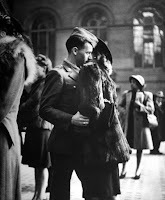 Valentine performed marriage ceremonies in secret, and when he was caught was executed. Another story claims Valentine played an integral part in helping Christians escape from Roman prisons. Then there’s the viewpoint that the Christians moved St. Valentine’s feast day to February 14 in order to Christianize the festival of Lupercalia. The festival was later outlawed. During the Middle Ages the concept of romance was added to the day because it was believed that February 14th was the beginning of the mating season for birds. 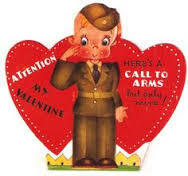 It wasn’t until the 1700s that Americans started to exchange Valentine’s Day cards. 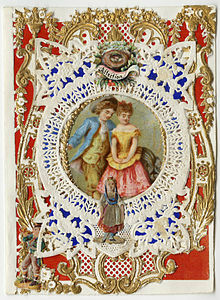 Known as the Mother of the Valentine, Esther Howland began to mass produce and sell cards around 1840. Her family owned a book and stationery store in Worcester, MA. Previously Valentine’s Day cards were imported from England, hence not affordable for many people. Esther created dozens of samples made with lace paper and ribbons, hoping to secure at least $200 in orders. Needless to say she was stunned when her brother returned with over $5,000 in advance sales. Ultimately the family would do over $100,000 each year, cementing Esther’s position in history.